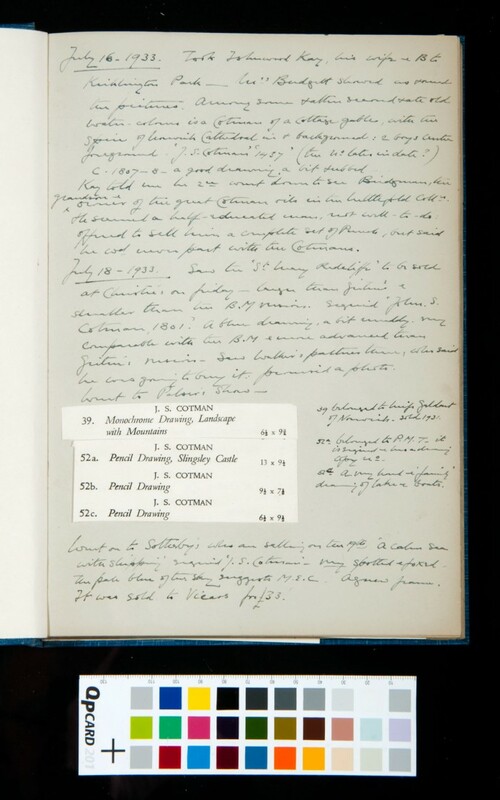 Volume IX is composed primarily of article clippings, correspondence, records of sales at Christie’s and Sotheby’s auction houses, and short journal entries detailing visits to see works by or attributed to Cotman. 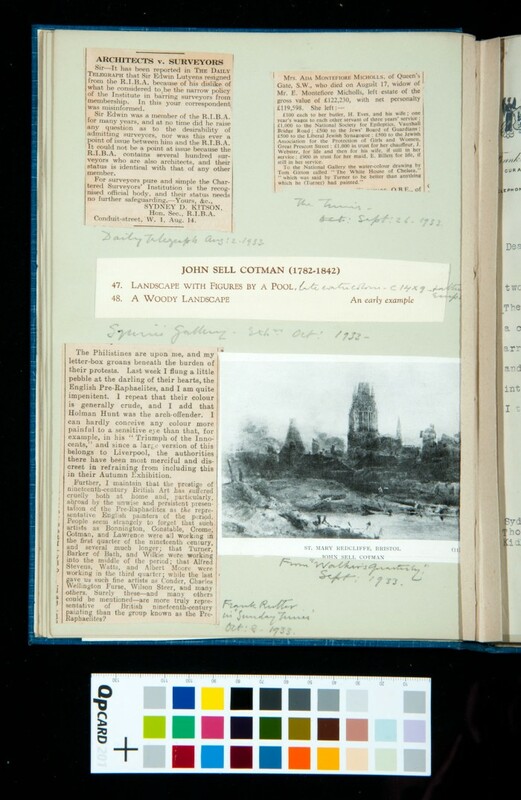 These syncopated journal entries, which sometimes utilise a personal shorthand, record visits to Norwich, Gordale Scar, and Malham Tarn. 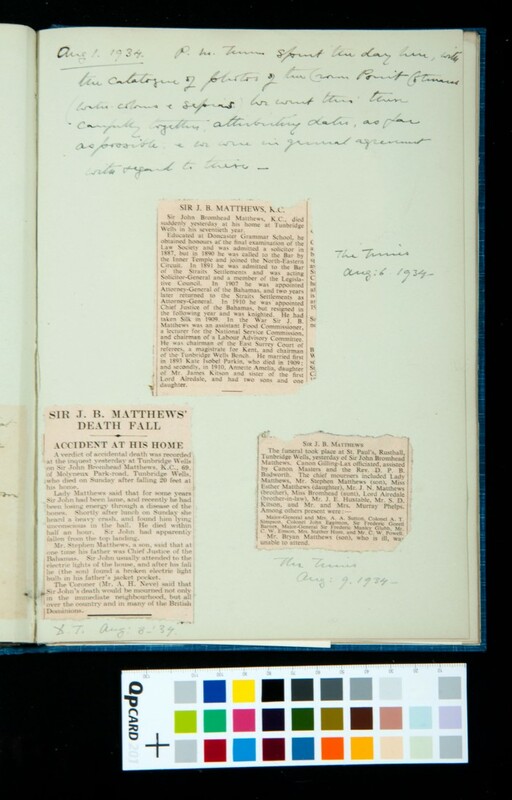 The articles which are regularly inserted into the volume are mostly from The Times and The Sunday Times. Primarily concerned with the contemporary exhibition of watercolour paintings, a few of these articles strikingly maintain the significance of early English Watercolour works over those produced by the Pre-Raphaelites and the Modernists. 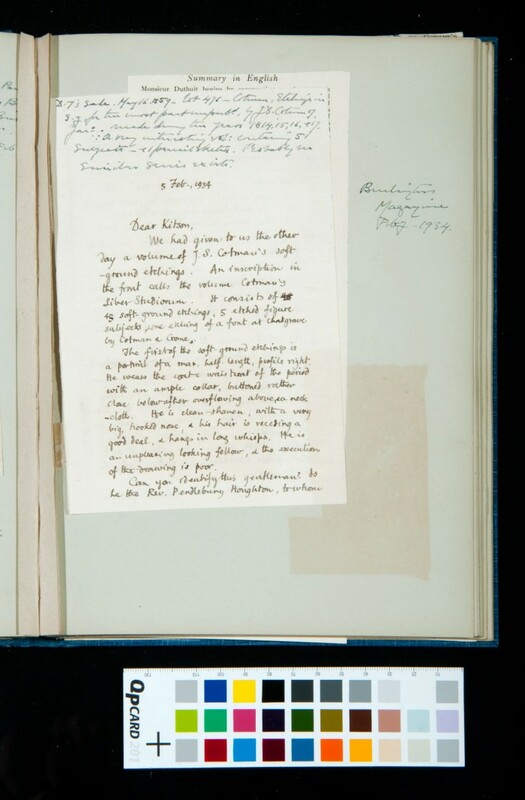 Much of the correspondence which Kitson includes in the volume is with museum curators and keepers (V&A; British Museum; Bowes Museum) and alludes to a couple of Cotman works which are now part of the collection in Leeds ('Barnard Castle from Towler Hill' and 'Coalbrookdale'). The references to Barnard Castle are accompanied by a sketch plan of the area, and appear in correspondences which record attempts to find the spot Cotman painted from. 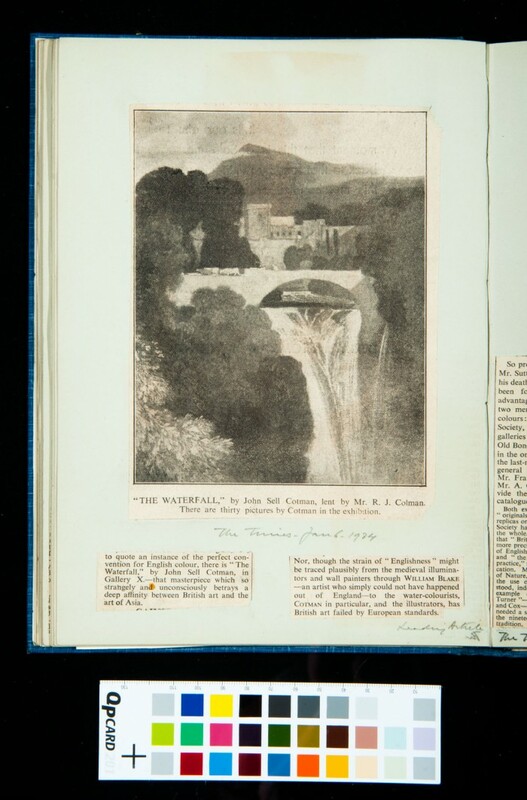 Other Cotman works that are mentioned in the volume appear under the titles of the ‘sculptor’, ‘Landscape with figures by a pool’, ‘A Woody landscape’, and ‘Thabley Castle’. 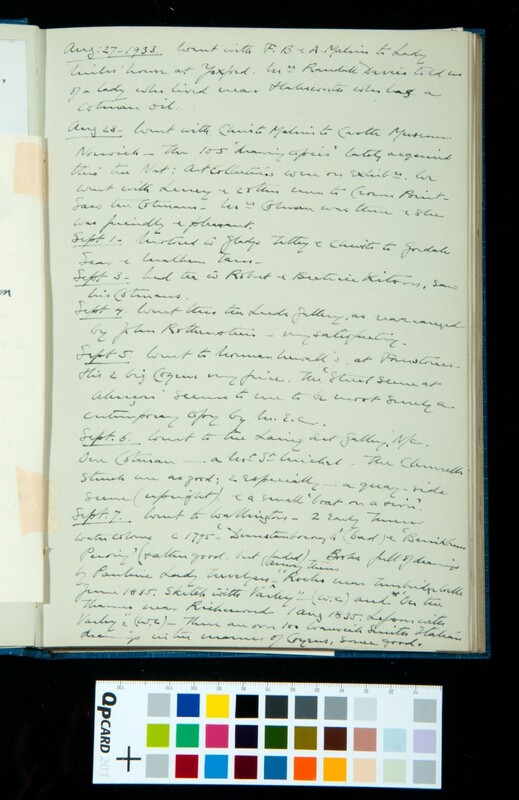 Further points of interest in the volume are a transcription of a short biography of Cotman and references to Kitson’s involvement in the Walpole Society. Pasted insert with drawing and annotation. 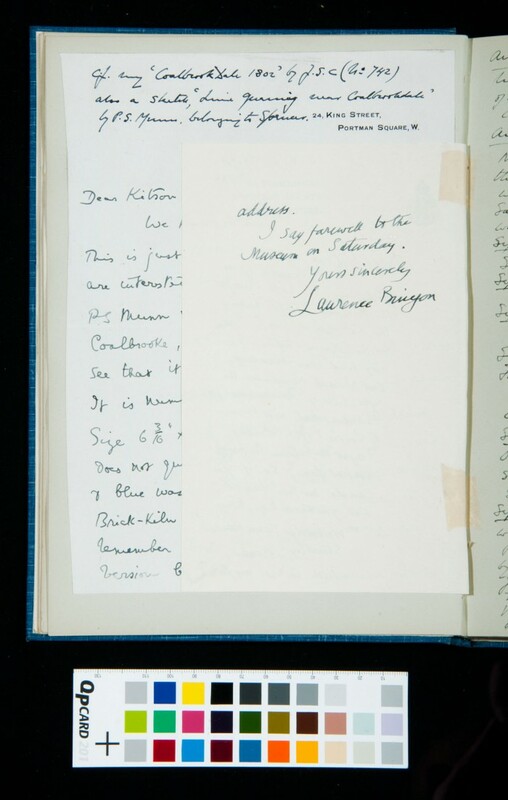 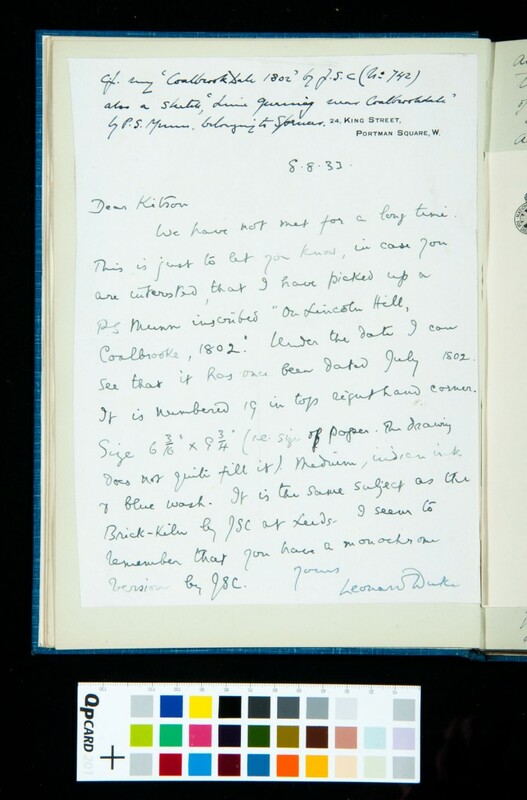 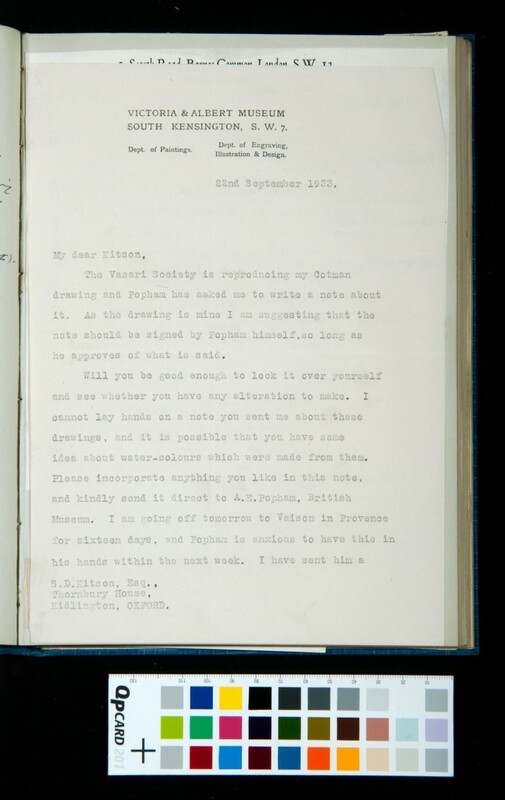 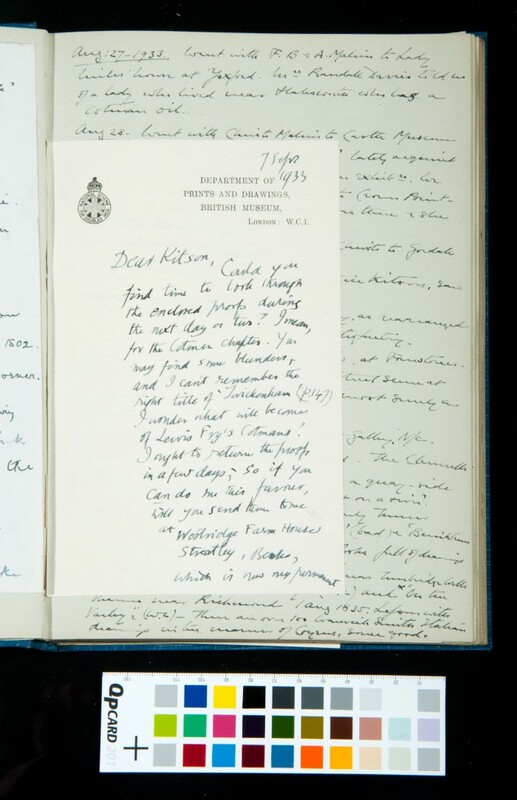 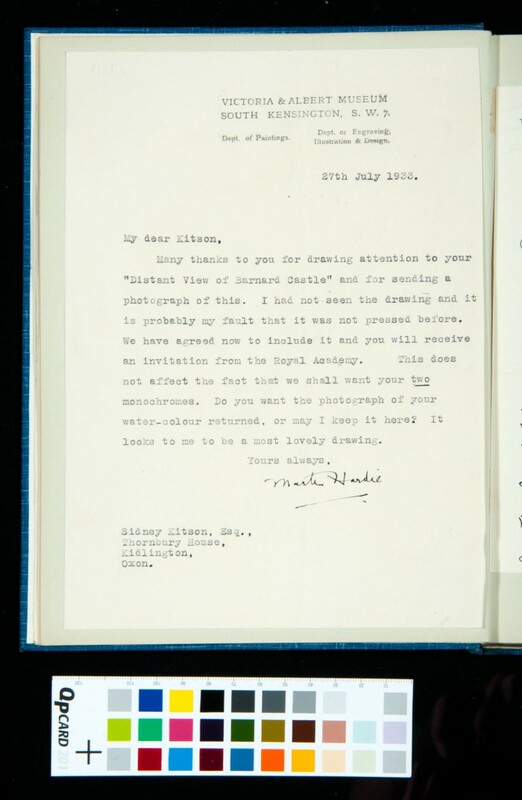 Letter from Laurence Binyon to Kitson. 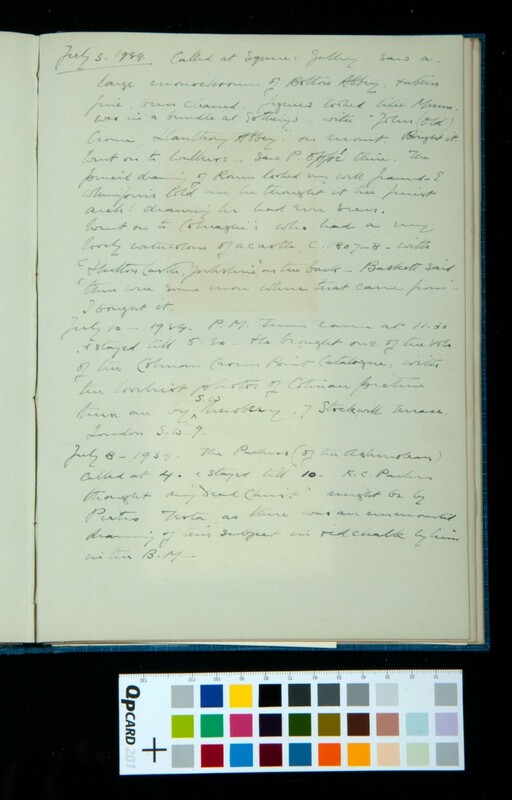 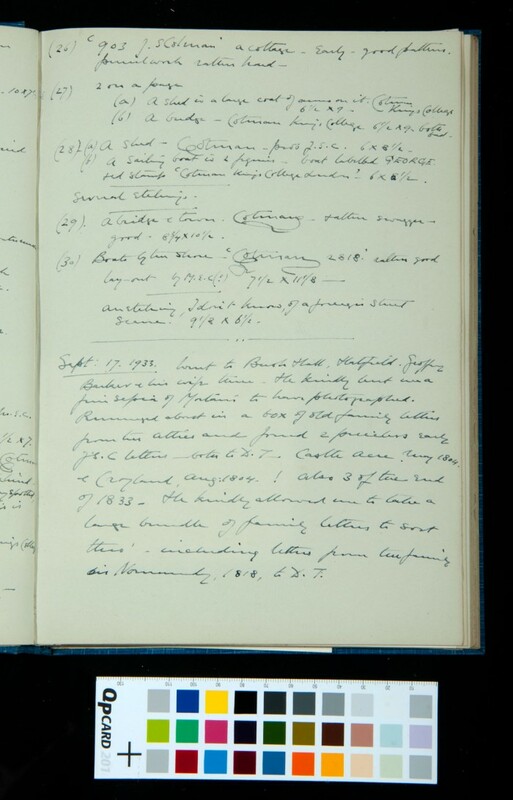 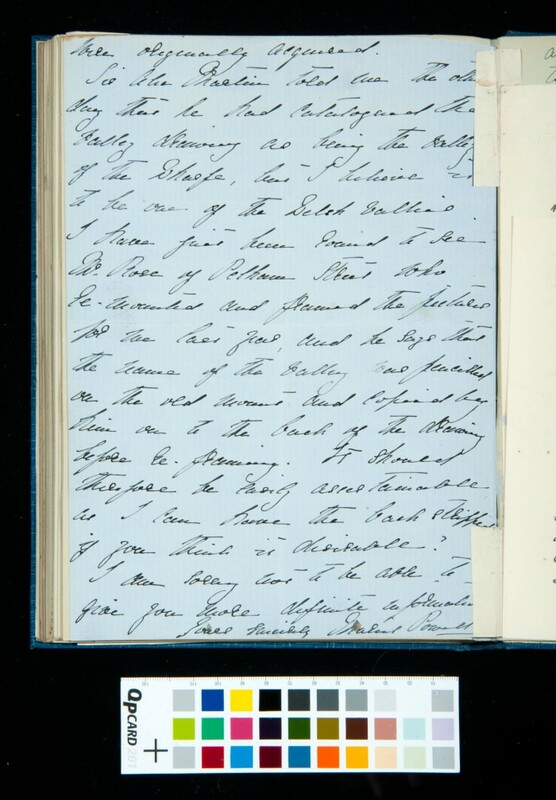 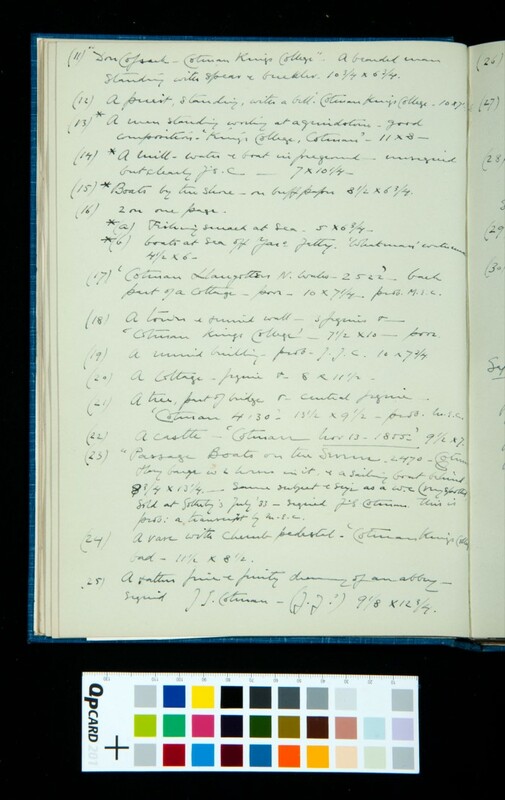 Itemised record of Cotman works and related artefacts, and journal entry. 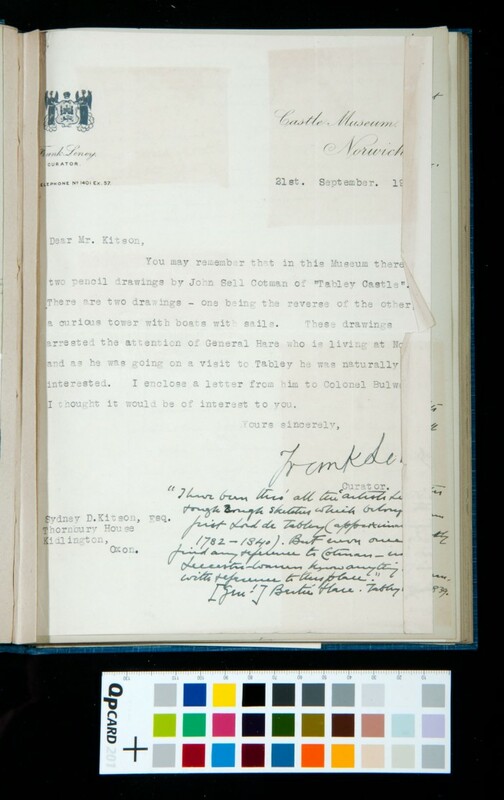 Reverse of insert to p.11, letter from A. J. Finberg to Kitson, and clipping from The Times with annotation. 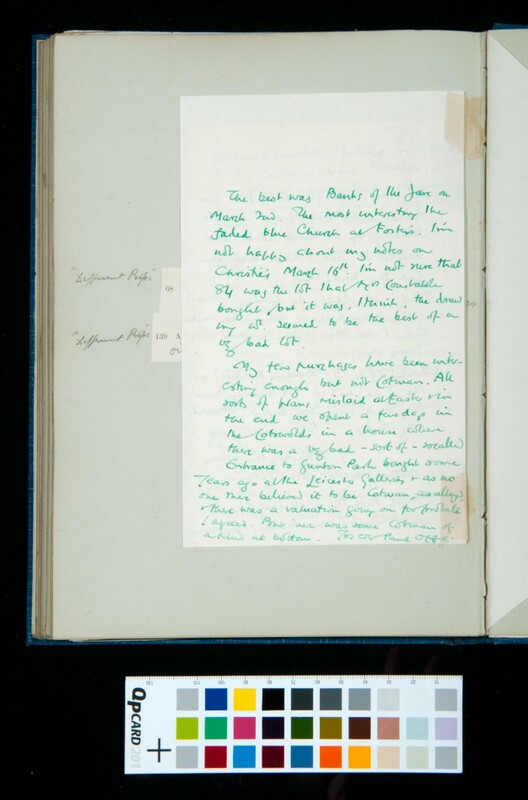 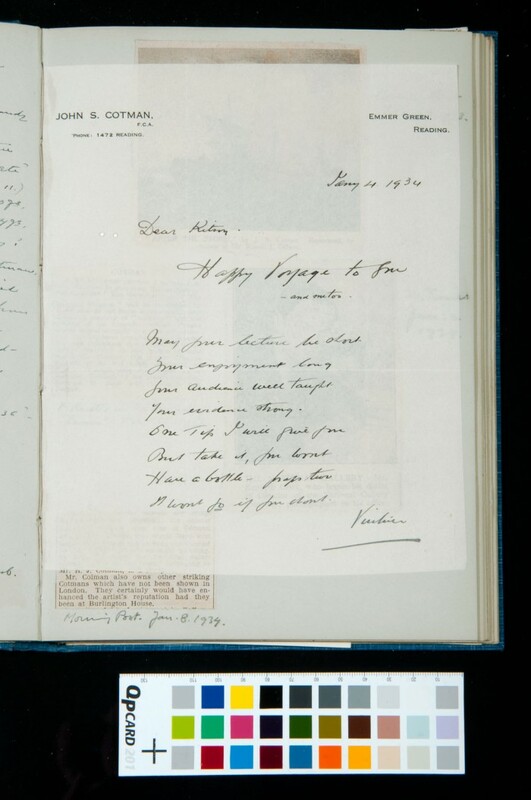 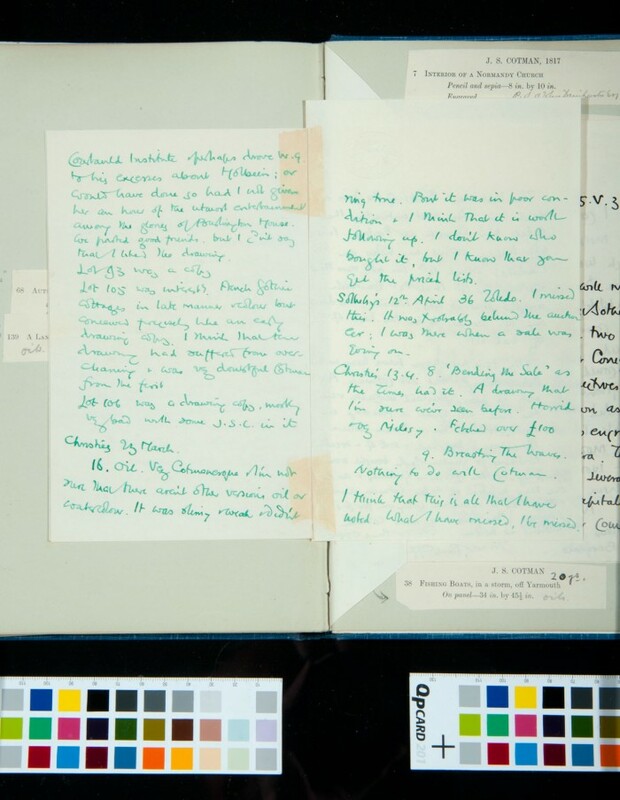 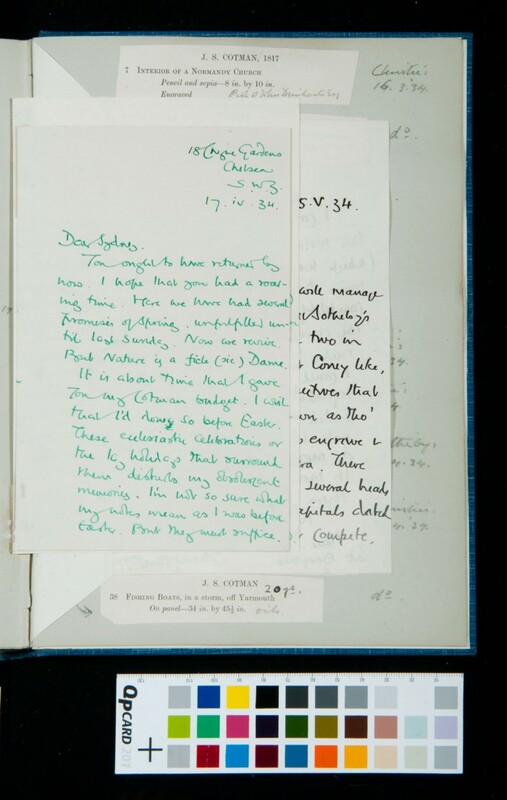 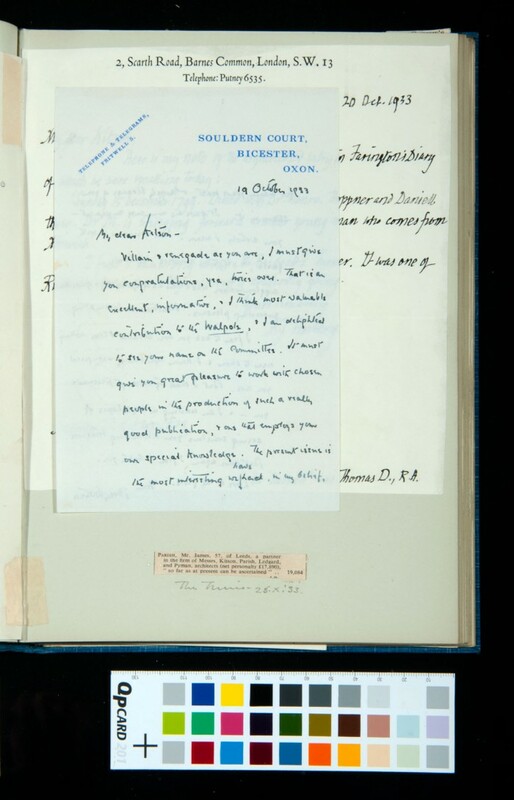 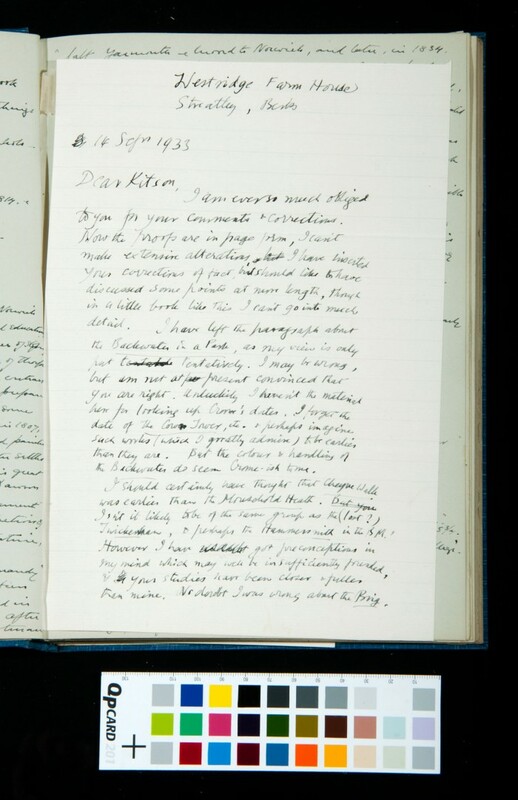 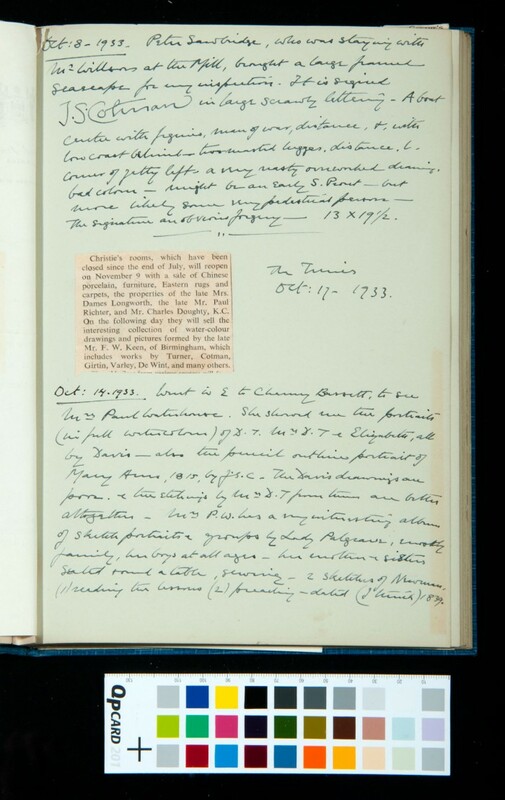 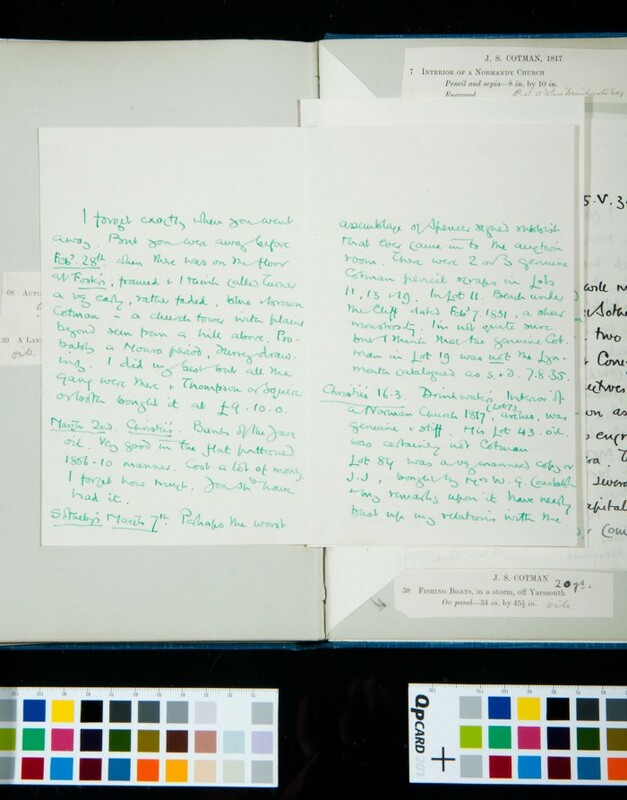 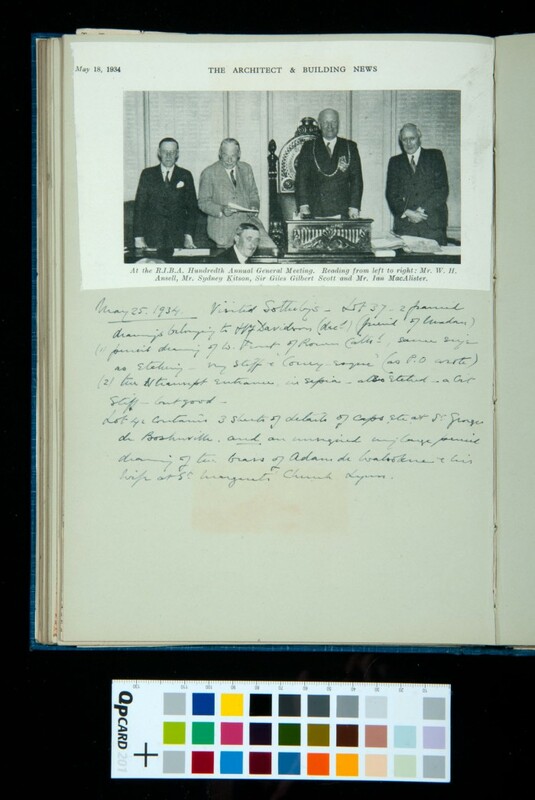 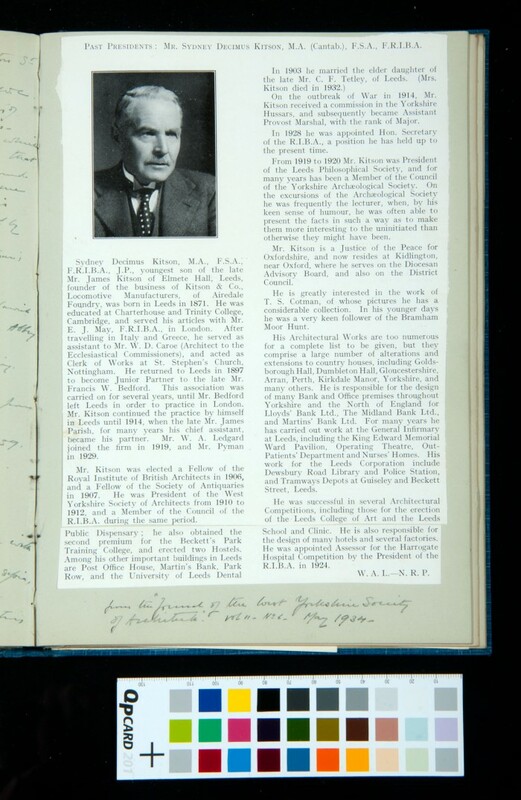 Two clippings, two journal entries, and annotation in Kitson's hand. 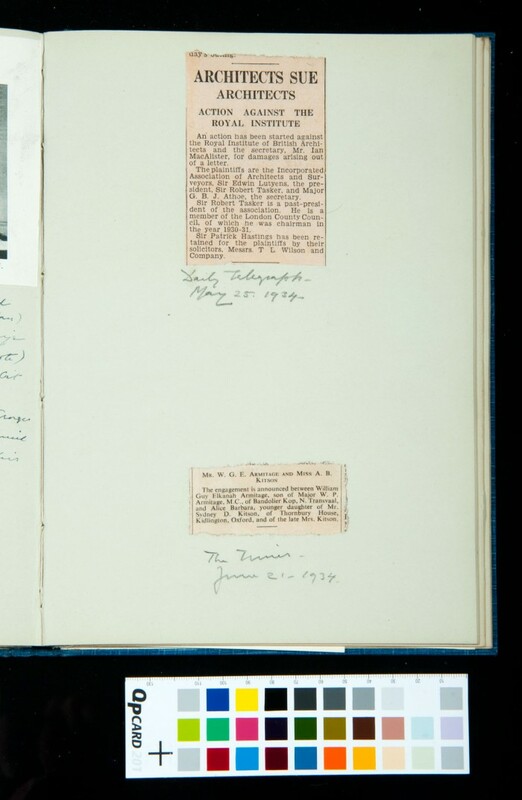 Four newspaper clippings of articles and obituaries, and a set of notes in Kitson's hand. Clippings from Burlington Magazine, and the Observer. 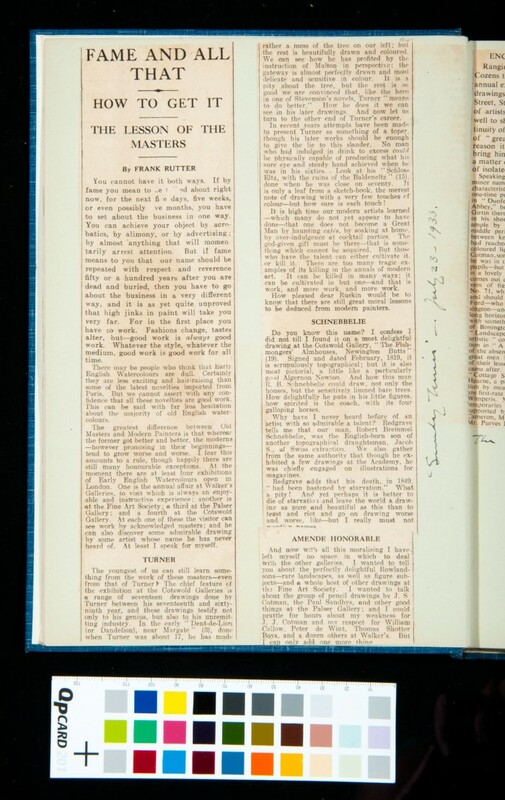 Article from Burlington Magazine, and Apollo Magazine. Three article clippings and Kitson annotation. 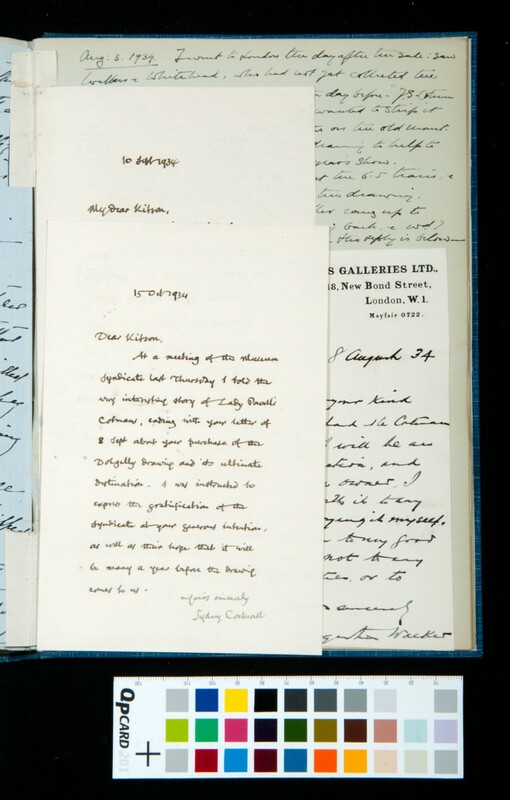 Letter from Jack W. Goodison to Sydney Kitson with hand-written note by Kitson. 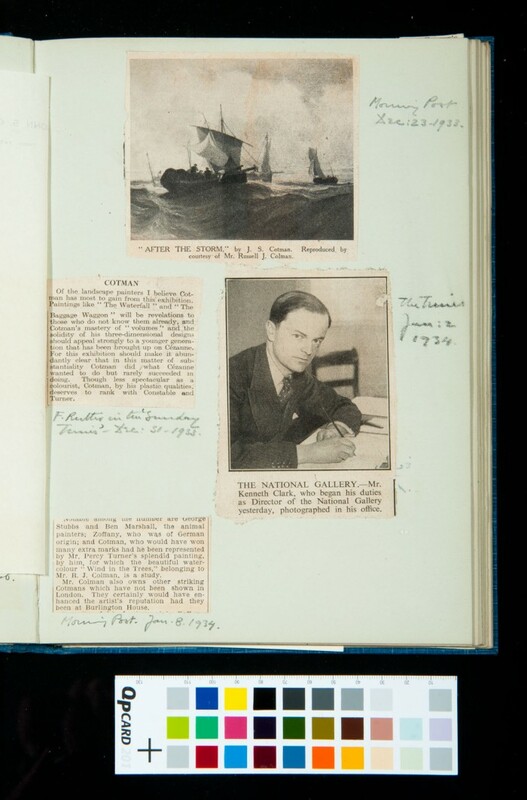 Clipping attributed to Brulington Magazine and dated Feb 1934 in Kitson's hand. 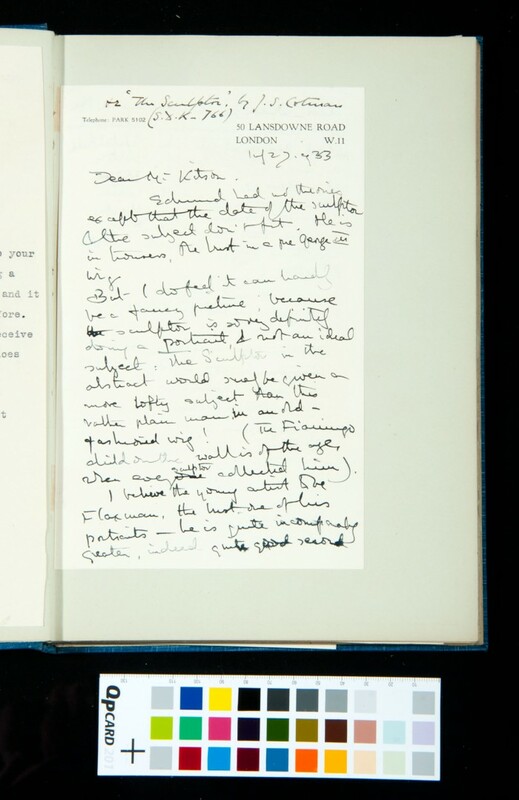 A clipping from The Spectator and The Observer with Kitson's annotation. Two clippings, one from The Times Literary, and the other from the Daily Telegraph. Newspaper clipping with photo captioned R.I.B.A hundredth Annual General Meeting, and a journal entry. 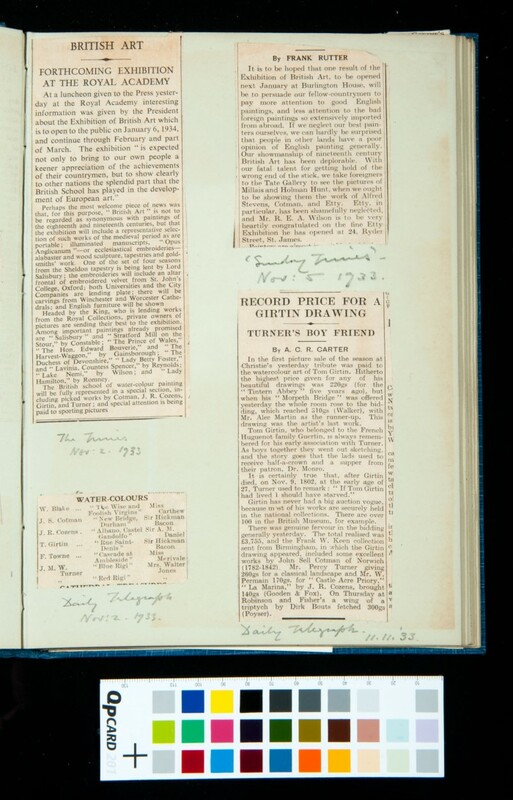 Articles from the Daily Telegraph and The Times, with Kitson annotation. 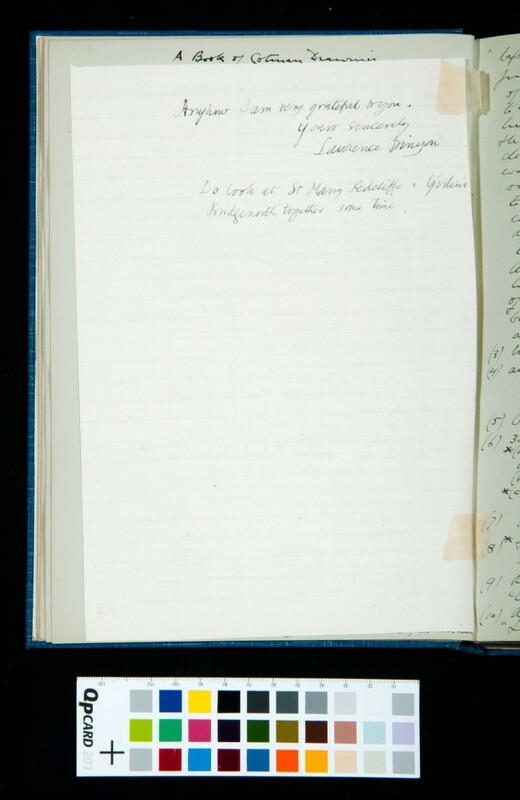 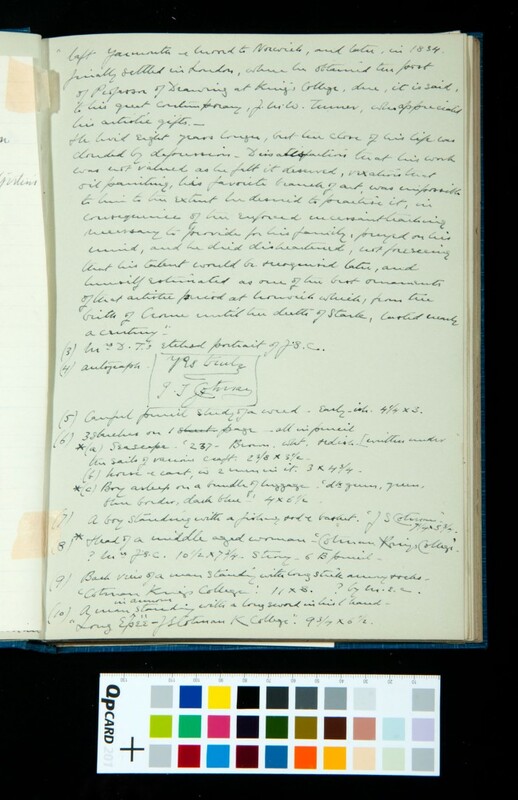 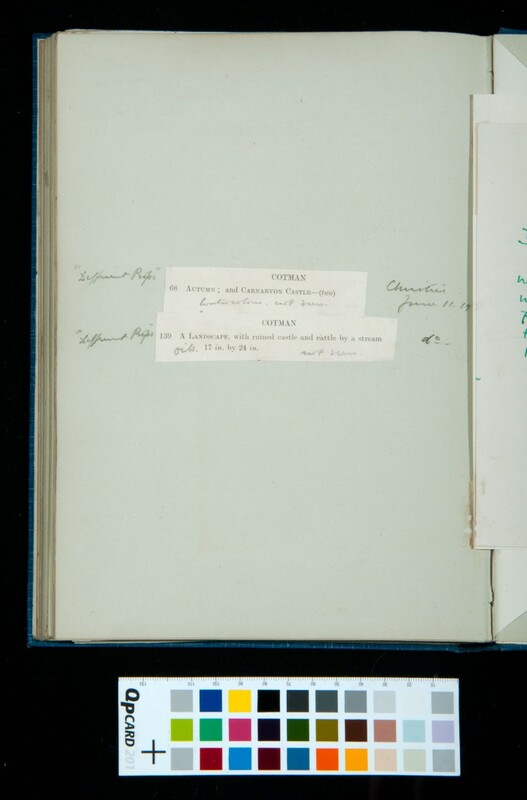 Journal entry describing work titled Fountains Abbey. Clipping from the Journal of the West Yorkshire Society of Architects, and Kitson annotation. Two article clippings from The Times, and Kitson annotation. 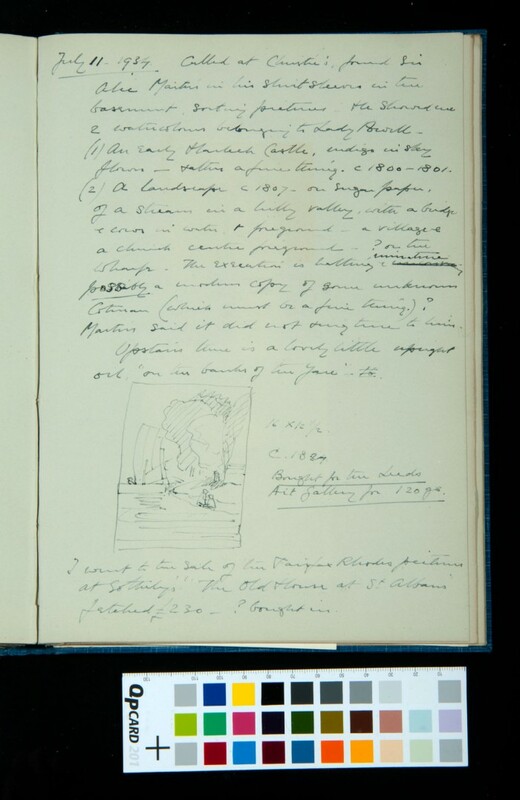 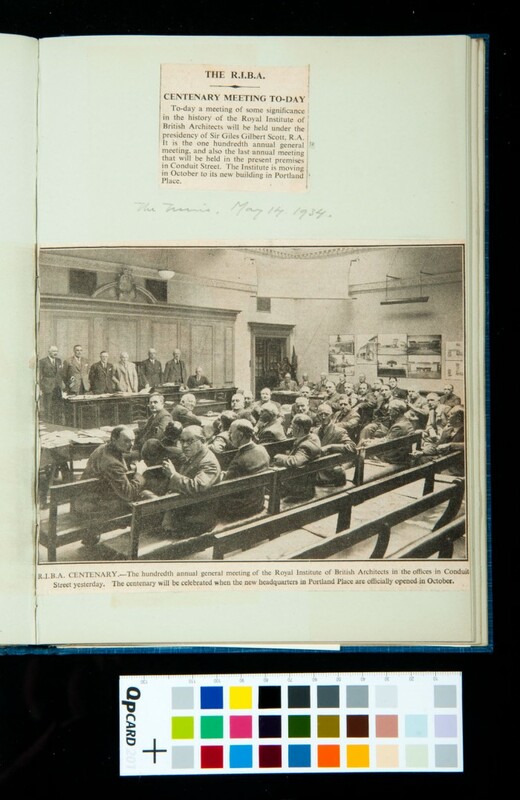 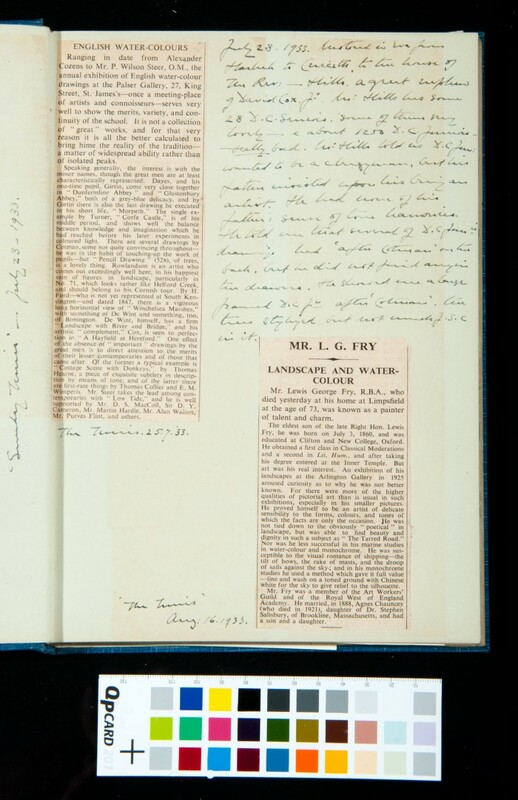 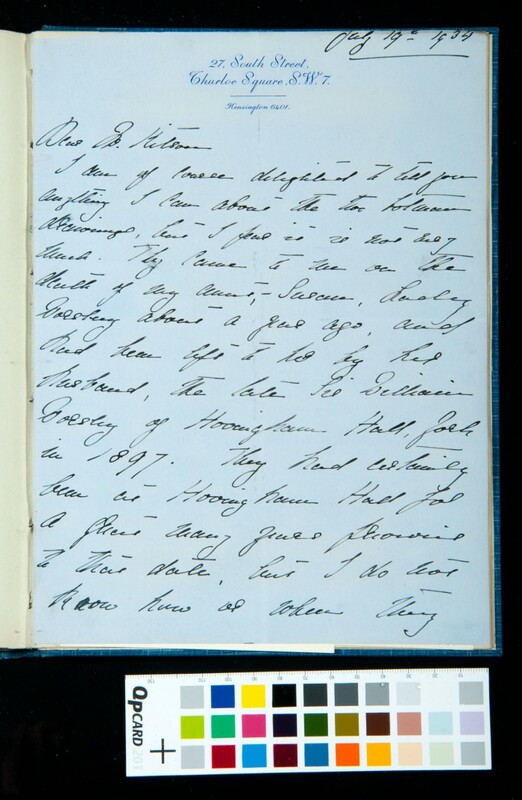 Journal entries describing visits to three galleries, and the purchase of a water colour. Times article with Kitson annotation, and clipping with a photo of a work by a work by J. 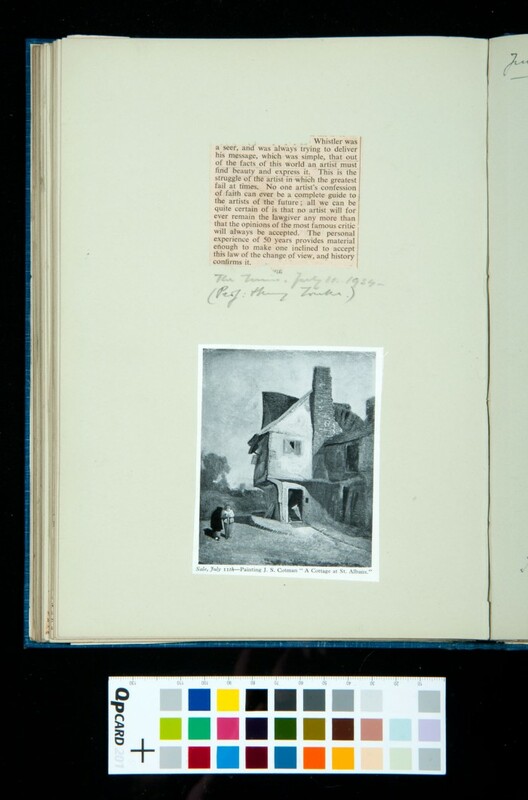 S Cotman titled "A Cottage at St Albans." Clipping of article by Sydney Kitson on Sir Ian MacAlister published in the Architecture Review. 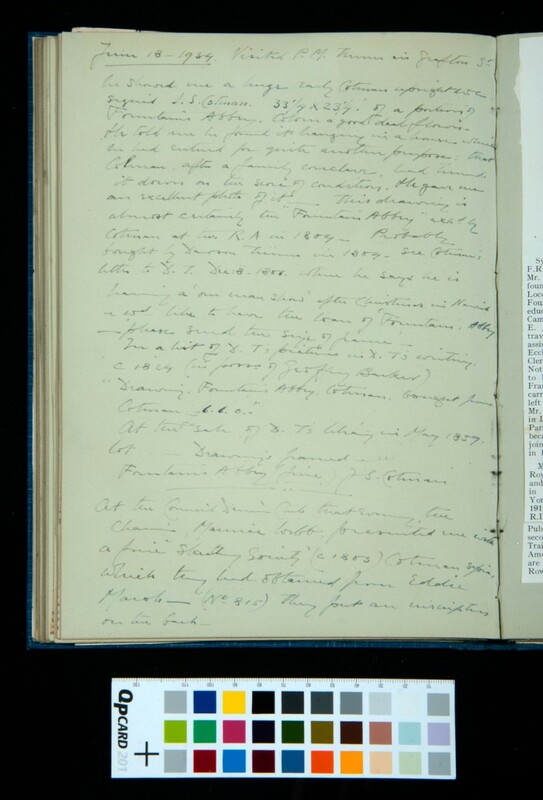 Article continues on p. 26 recto. 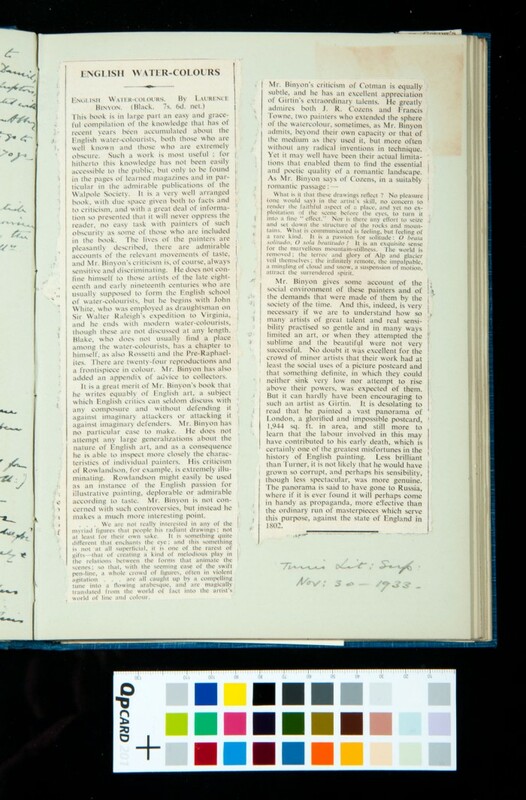 Continuation of article on p. 25 verso, short clipping on Sydney Kitson, and annotation by Kitson. 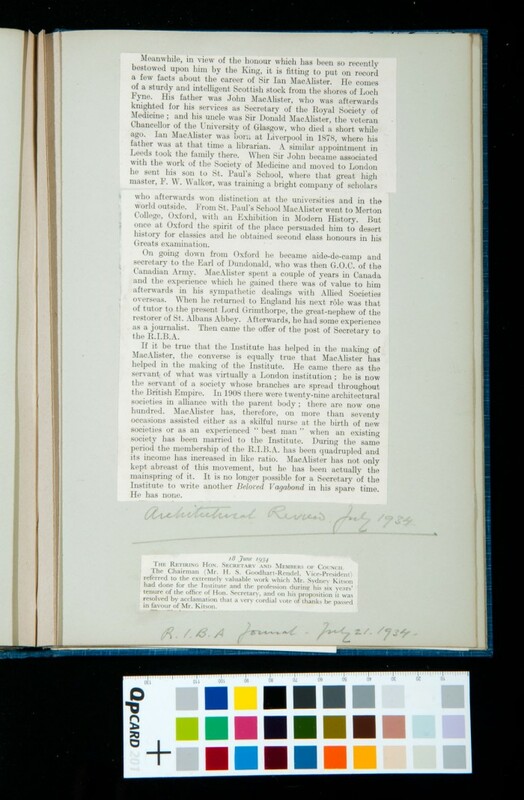 Continuation of article in The Architectural Review on Ian MacAlister, Kitson annotation, and a journal entry. Journal entry and three articles. 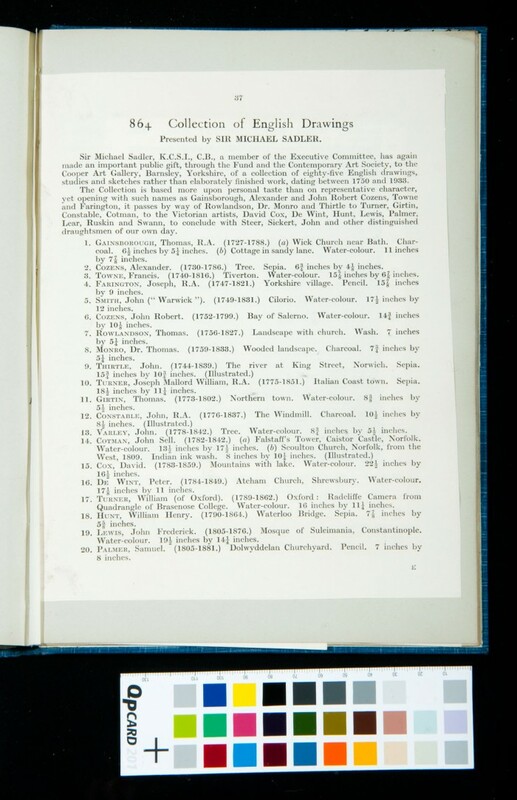 A listing of a donation made by Sir Michael Sadler. 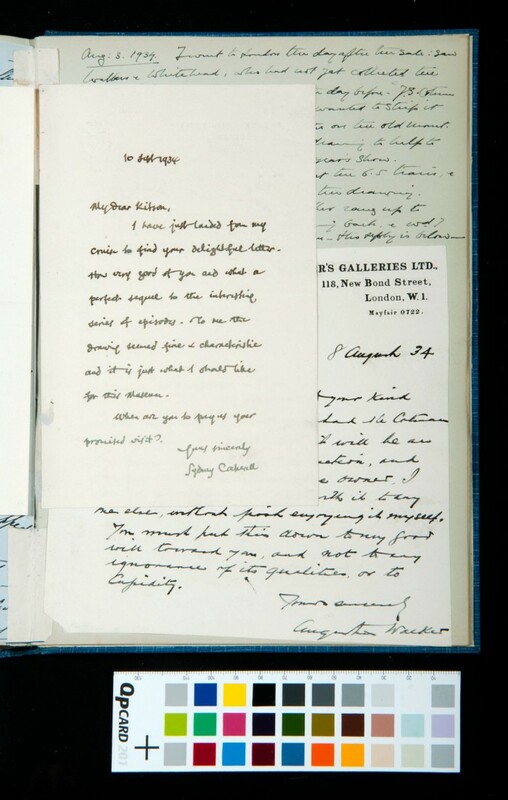 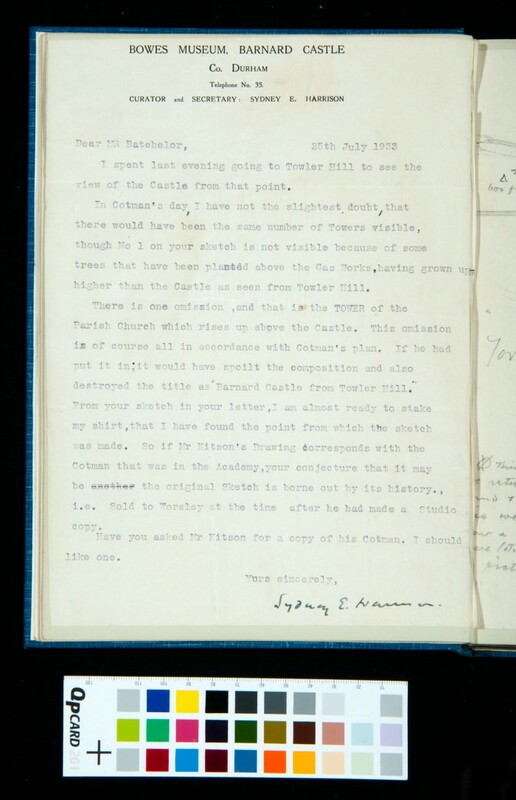 Letter from Sydney Cockerell to Sydney Kitson. 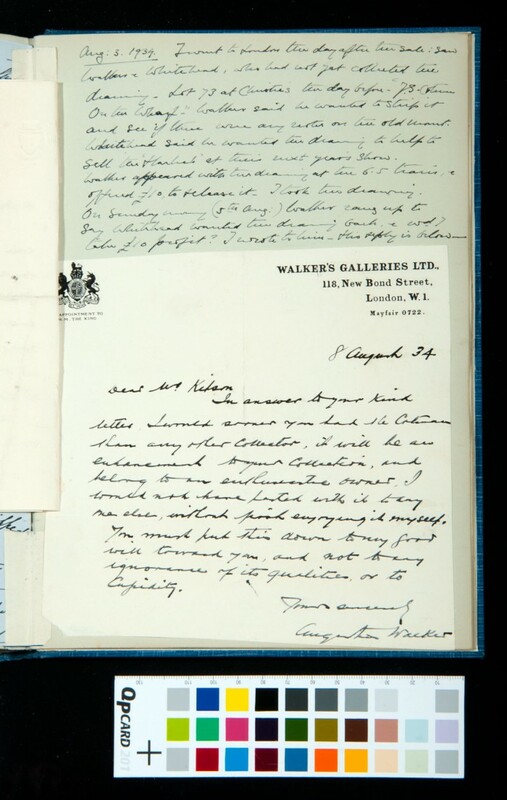 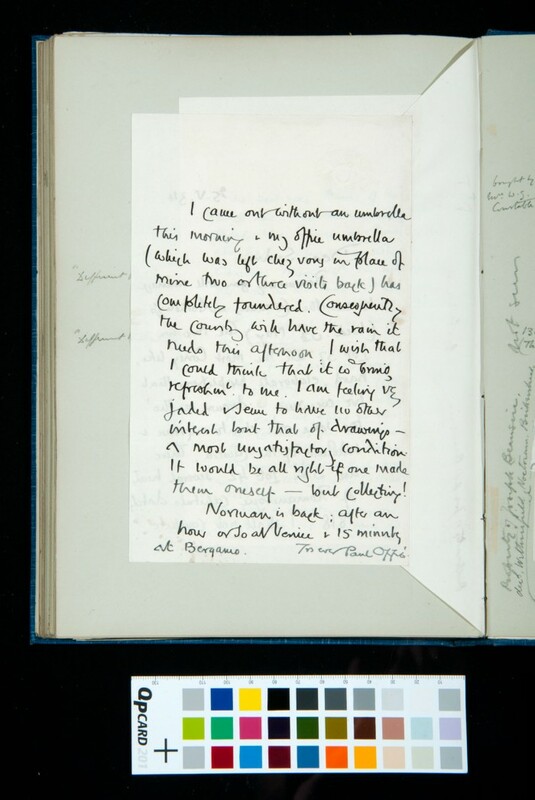 Journal entry, and letter from Augustus Walker to Sydney Kitson. 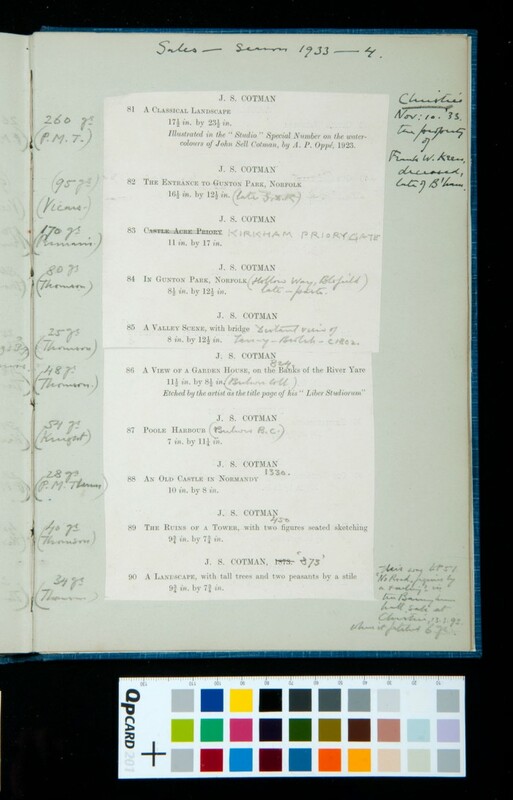 Listing of ten Cotman works with handwritten annotation by Sydney Kitson. 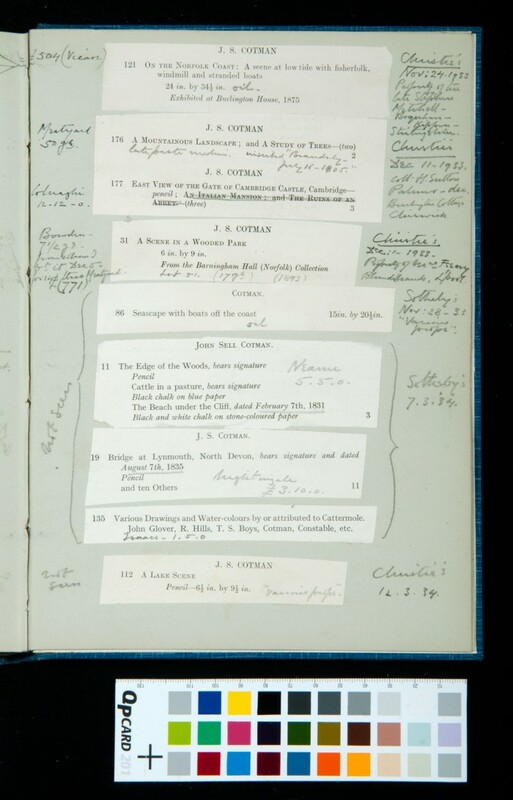 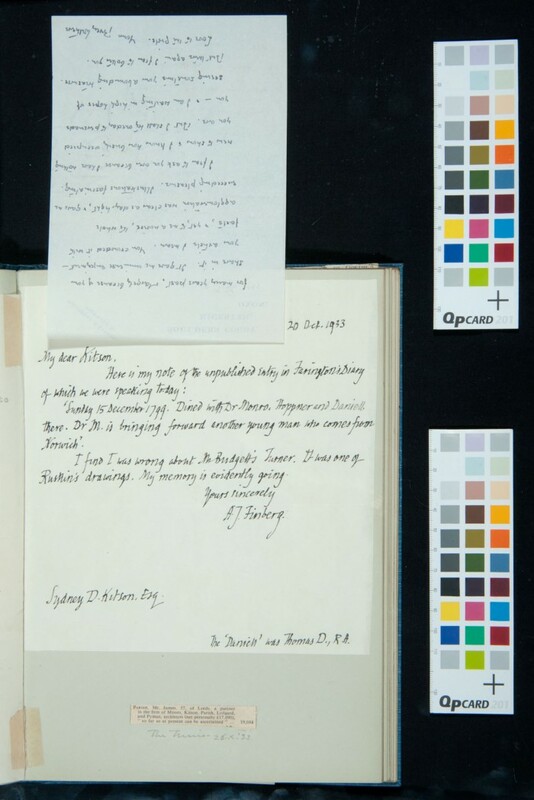 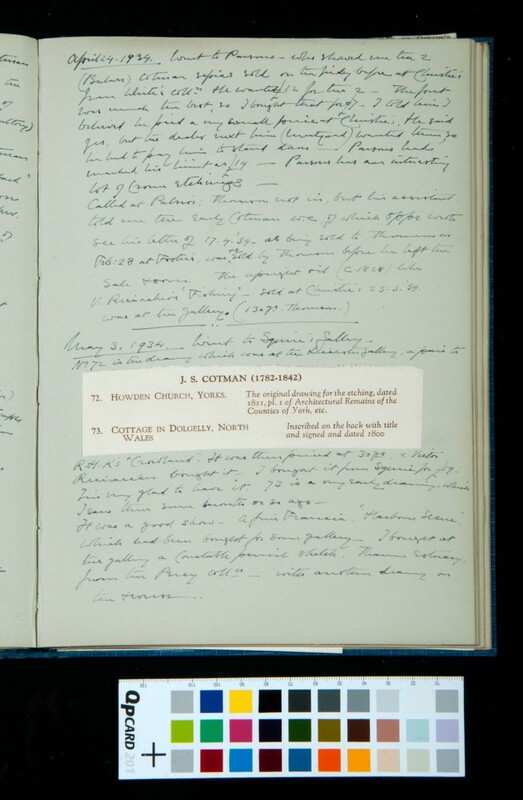 Listings of nine Cotman works with handwritten annotation by Sydney Kitson. 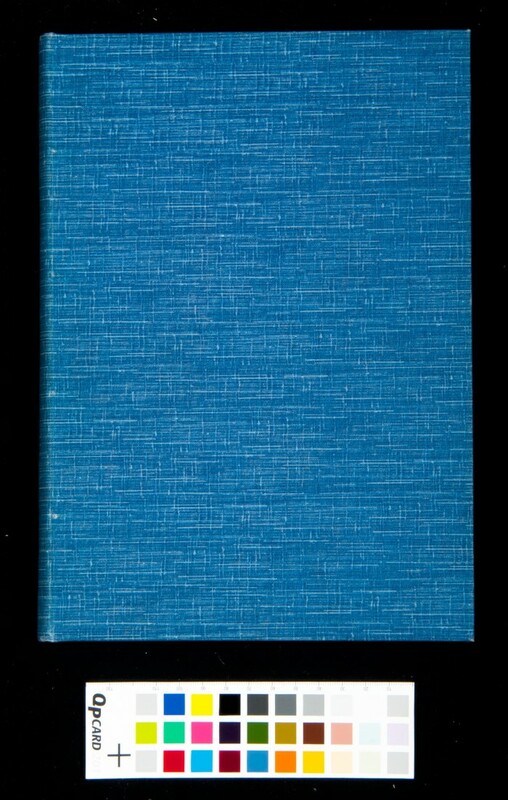 Two pasted listings of Cotman works and Sydney Kitson's annotation. 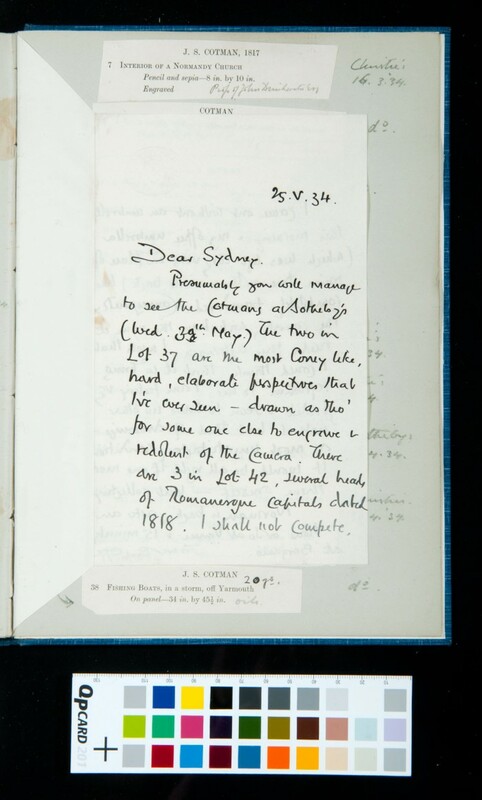 Letter from Paul Oppé to Sydney Kitson. 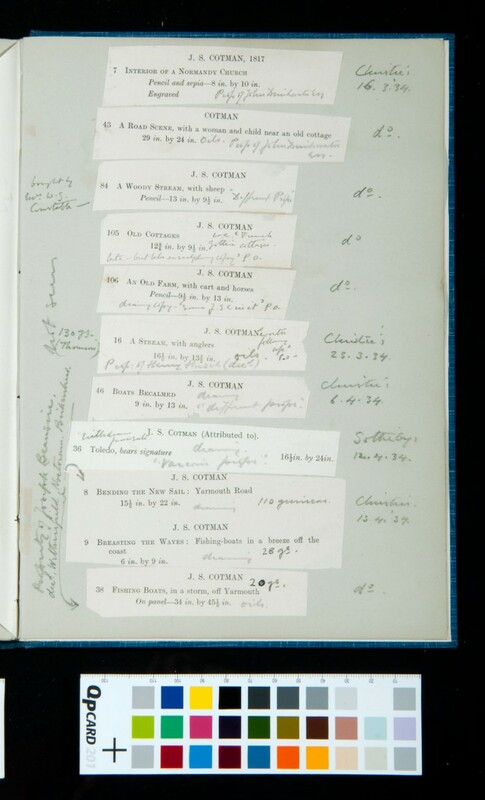 Individual clippings of listings of 11 Cotman works with pencil annotation by Sydney Kitson. Individual clippings of listings of 9 Cotman works with pencil annotation by Sydney Kitson.